If you keep pet fish, you know that they poop, but it's harder to discern whether they urinate. However, if you don't clean the tank regularly and start smelling ammonia, there's your answer. Fish do pee, but freshwater and saltwater fish go about it in a different fashion. According to the Virginia-Maryland Regional College of Veterinary Medicine website, fish basically urinate all the time. Fish urinate either through their gills or through a "urinary pore." The latter eliminates urine that has been filtered via the kidneys. Saltwater varieties excrete most urine through the gills, while freshwater fish do so through the urinary pore. Saltwater fish take in a great deal of salt and must excrete it. Freshwater fish have to get rid of all the water they take in. Fish have two kidneys. The head kidney filters out wastes that go through the gills, while the posterior kidney filters wastes that go out the urinary pore. In freshwater fish, the kidneys save ions and excrete water. For saltwater fish, the kidneys conserve water and eliminate ions, with most of this waste material exiting through the gills. While fish urine primarily consists of ammonia, that's not all it contains. Depending on the species, ammonia leaves the body primarily via the gills. Fish urine also includes amino acids, a small amount of urea and the organic acids creatinine and creatine. Saltwater fish urine contains a great amount of salt, while freshwater fish urine consists primarily of water with small amounts of salt. Freshwater fish produce a lot of urine. Saltwater fish produce far less, and what they do excrete is quite concentrated. Fish can suffer from urinary tract and kidney diseases, some of which result from parasite infestation. 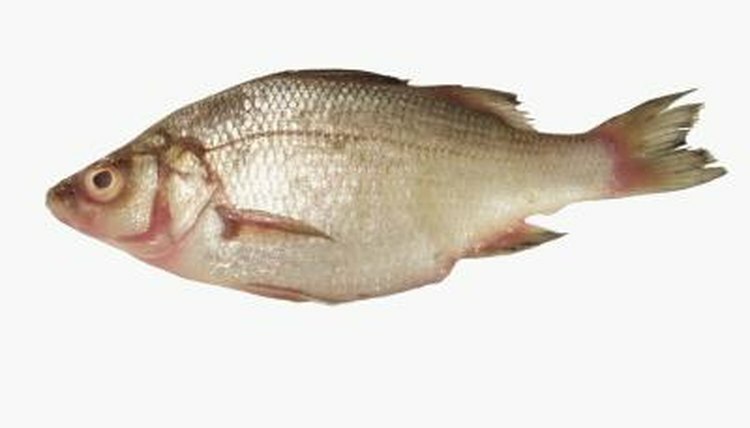 Renal dropsy, common in goldfish and other carp species, is caused by a parasite, Sphaerospora auratus. Fish affected with this generally fatal condition exhibit swelling in the abdomen from accumulated fluids as the kidneys fail. Another parasite, Sphaerospora angulata, causes carp dropsy, a different disease in goldfish and other carp. While the abdomen also swells, in carp dropsy fish experience eye swelling. Fish usually die within six months after exhibiting symptoms. Proliferative kidney disease affects young, commercially-grown trout and salmon. In addition to abdominal and eye swelling, fish with this fatal ailment become extremely sluggish. Practical Fishkeeping: What Does Fish Urine Consist Of?